"She journeyed with only a bird for company--destination uncertain but certainly assured. A calm, well-dressed adventuress, to be sure!" Original pen-and-ink and watercolor on 90# CP (185 gsm) paper, unframed. "A calm and wise woman in a pointy hat quietly contemplates the choices...this one or that one? Both choices are so very interesting, aren't they?" Original pen-and-ink and watercolor on 140# CP (300 gsm) paper, unframed. 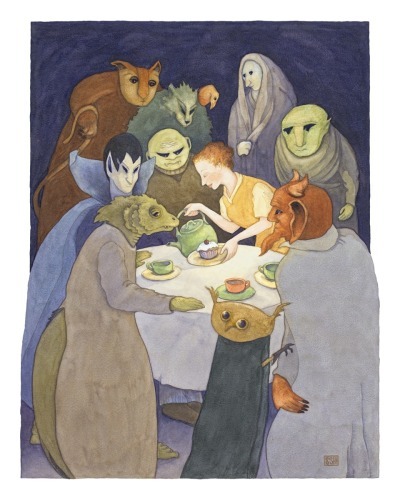 "Inviting one's demons (or fears) to tea as the gentle path towards releasing them. Inspired by a tale told about the legendary Tibetan yogi and poet, Milarepa. 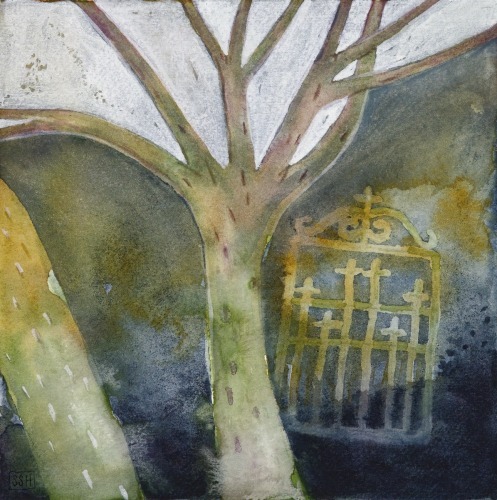 This watercolor is an inspired elaboration of an older oil painting. " Original watercolor, pen-and-ink on 90# CP (185 gsm) paper, unframed. 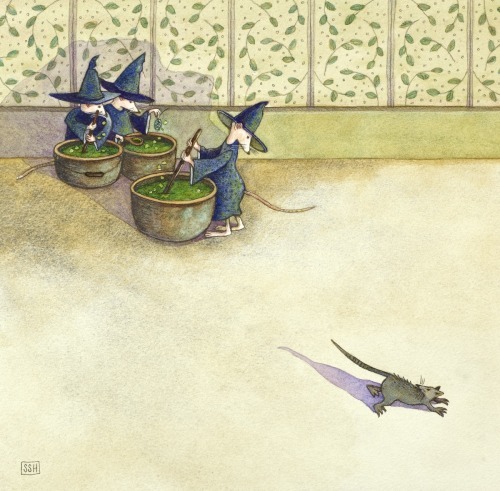 "Three witch mice, magical brews and no recipe: a dangerous situation for a mouse just passing by! Of course, it's probably a dark and stormy night too..."
A tense-looking donkey in a flaming orange dress, with tiny heads everywhere--what an image! 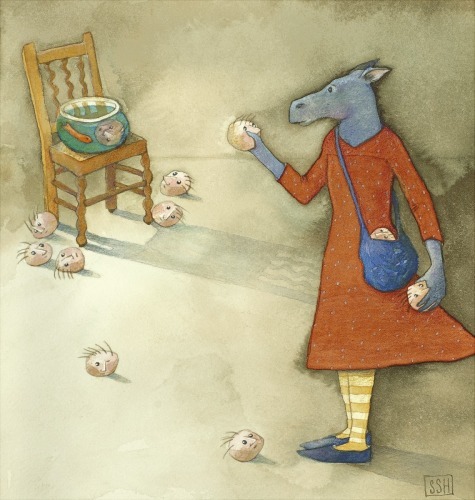 That evening the donkey wrote in her diary, "At the time, tossing heads seemed like the absolute perfect way to relax. Later, it all seemed rather silly." 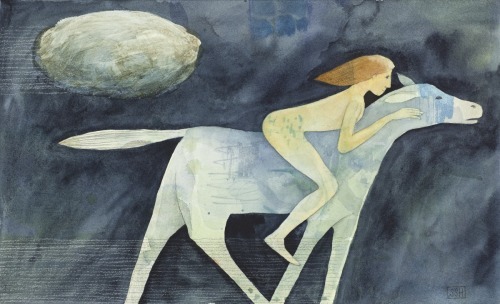 "As fast as her horse ran, she still could not escape the cloud. And why was it following her anyway? Fantasy, dream and nightmare in one mysterious mix." "Who is that strange, seed-tossing visitor?" 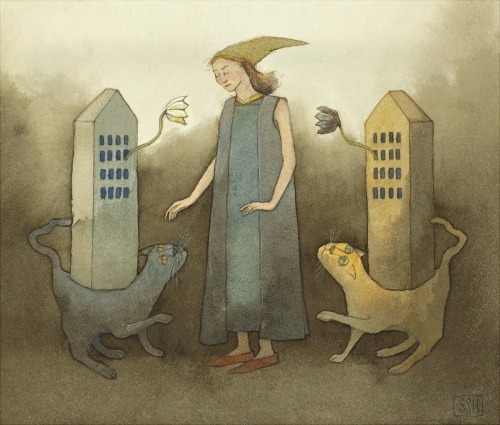 the birds and the four-legged creature wondered. He seemed harmless enough..."
"What a common dilemma: one side says "Yes!" but the other side isn't so sure. 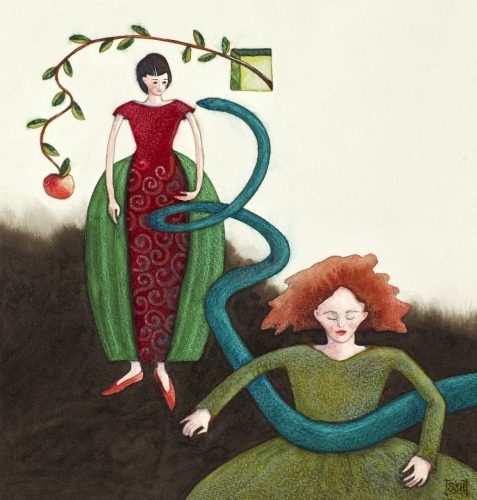 The archetypal story of Eve's temptation, wrapped up in everyday clothes." 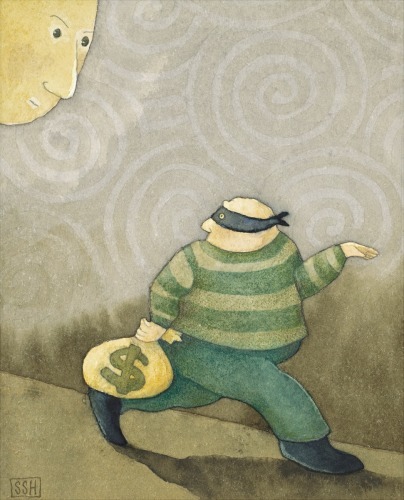 "The thief really thought he was getting away with it...but then he looked back and saw the All Knowing's face. Dang." "Her strength was in her uniqueness, and she chose to go her own way, instead of following the crowd." Pencil, gouache and watercolor on 140# HP (300 gsm) paper, unframed. 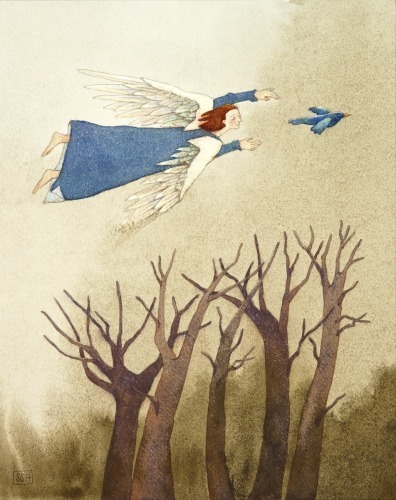 "A watchful angel watches over a young bird's first flight. Sensing that All Truly Is Well, the bird follows his nature and his heart to adventures and places unknown." 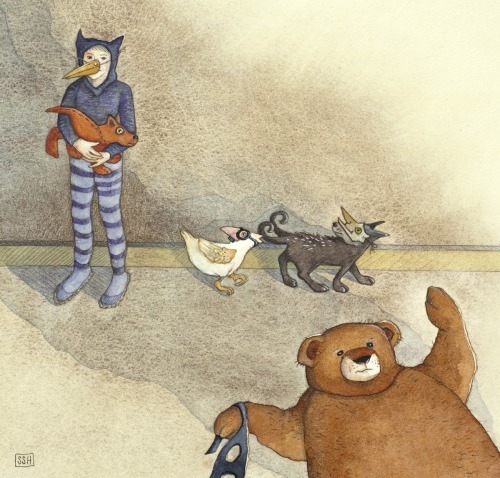 "There's a silly game of masks and costumes going on here...but the bear refuses to play." Pen-and-ink and watercolor on 90# CP (185 gsm) paper, unframed. 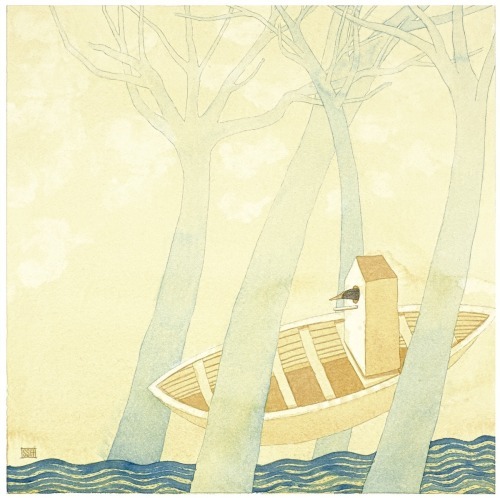 "Mr. Tweet began his journey to find a new home. 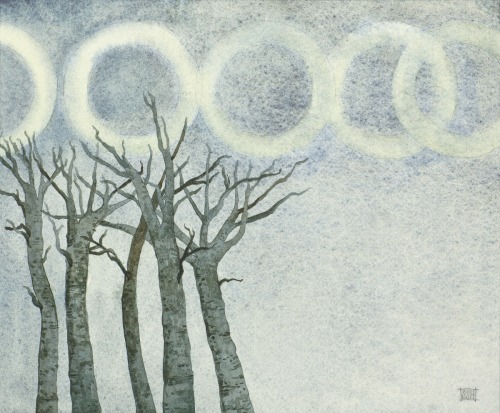 The silent trees watched him float quietly by. The journey could take him anywhere, anywhere at all..."
Original pen-and-ink and watercolor on 140# HP (300 gsm) paper, unframed. 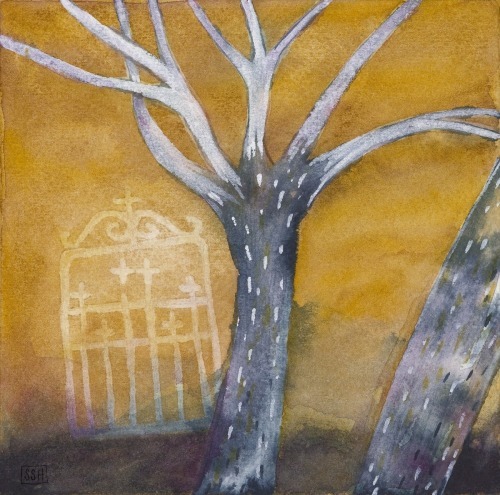 "On the day that Mr. Tweet's owner disappeared, he found his cage door open..."
"A foggy, night-dream scene of gates and trees...the mysterious, silent guardians of other worlds. What is just about to happen in the dell, one wonders...?" Original pen-and-ink and watercolor on 140# CP (300#) paper, unframed. 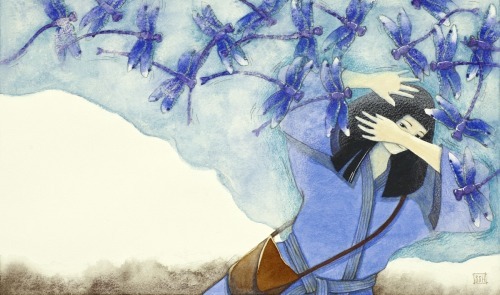 "A mysterious fairy on an equally mysterious flying creature invites the dreamer into another world. What strange and magical things await, one wonders?" Original pen-and-ink, gouache and watercolor on 90# CP (185 gsm) paper, unframed. 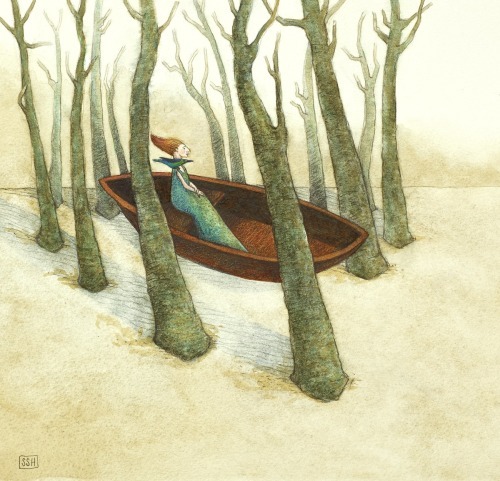 "It was a long journey, full of trials and tribulations, but there was always mysterious help when she was most in need. Being a fairy tale, of course it all ends happily." 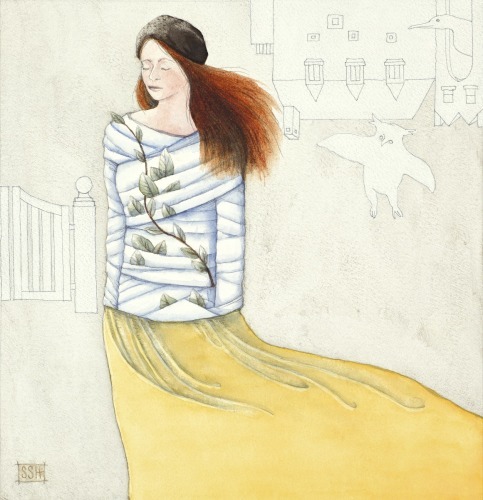 Inspired by the Grimms' story, "The Girl with Silver Hands," also known as 'The Handless Maiden.' 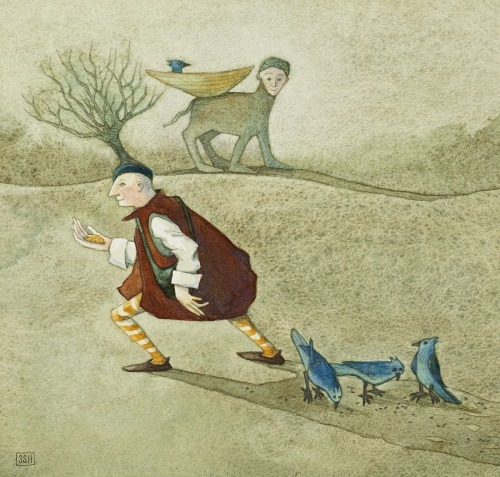 This image has appeared on the cover of a scholarly treatise based on elements in the Grimms' tales. 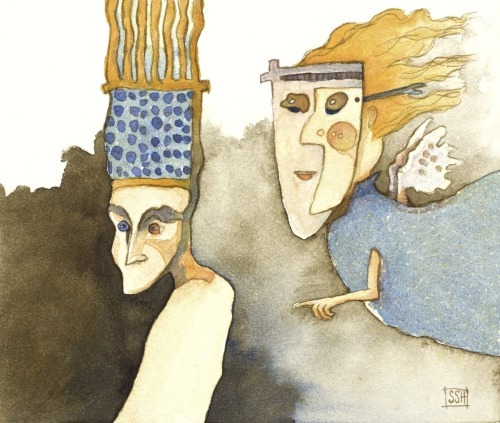 Original pen-and-ink and watercolor on 90# (185 gsm) CP paper, unframed. "The steaming teapot sees the moon and the moon sees the teapot. What can they each be thinking on this mysterious Winter night?" 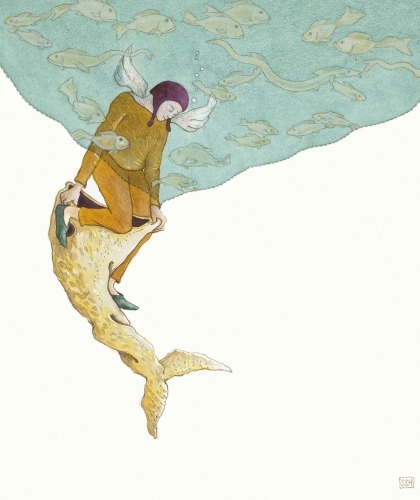 "The angel wondered what it would be like, living under the sea. 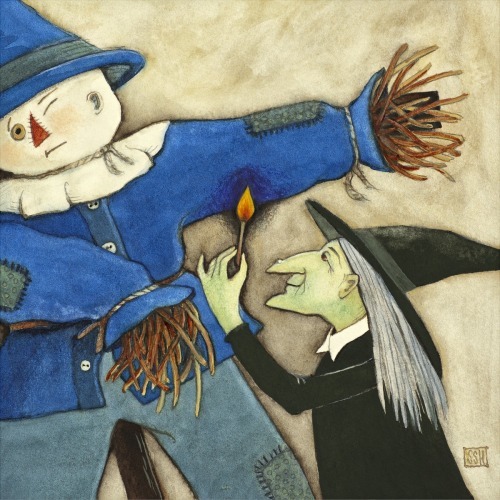 Certainly it would be quite different from his own airy realm..."
"The Scarecrow's worst fear, a burning match! How could she have known his fear, we wonder? The power of evil, I suppose. Being a fairy tale, it all ends happily (except for the witch, of course). 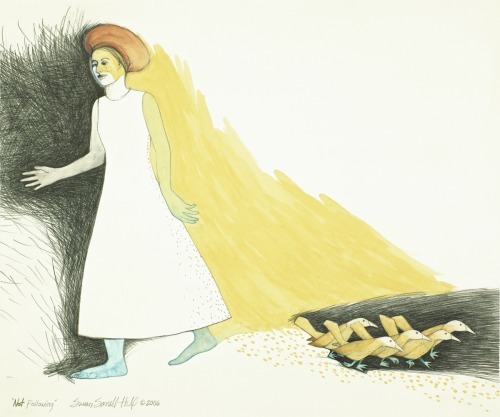 Inspired by the classic fantasy story, The Wizard of Oz." 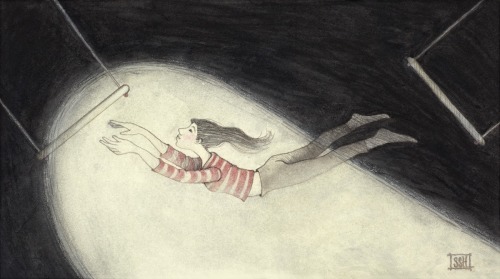 "She was in-between what was and what might be...and with no hesitation, she leapt. The archetype of letting go of one safety and trustingly reaching out for the next, played out in the magical realm of the circus." Original pen-and-ink and watercolor on 90# HP (185 gsm) paper, unframed. 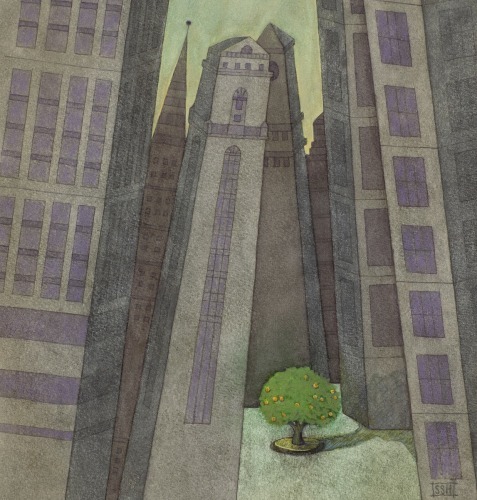 "A magical tree mysteriously--perhaps even joyfully--thriving in the middle of a gray concrete environment. Nature proves that it is possible with a bit of nurture and perseverance. " "In the shadow world she was closely bound, just as she was in waking life. Was it a dream, a fantasy or a nightmare? It was symbolic of something deep and mysterious, that was certain." "She dreamt that her arms were cocooned to her body and an owl spoke simple truths in the middle of a strange, upside-down world. Whether dream or vision, it was most certainly significant." 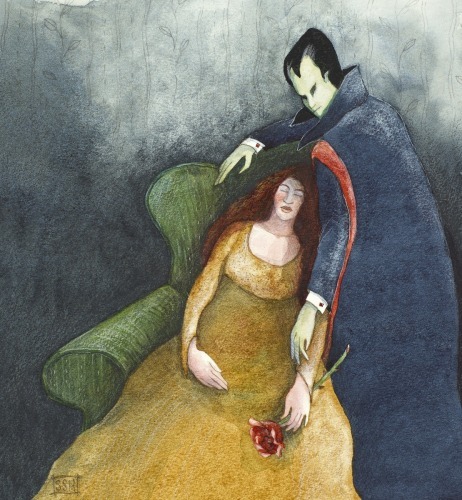 "The Night Visitor -- that oh so charming vampire -- is leaning close to a woman's lovely neck when he hears a tiny sound behind him..."
"What does one do with temptation and danger: meet it directly or turn and run? It's an archetypal situation, played out here in two different ways with two different women. What happens next, one might wonder?" 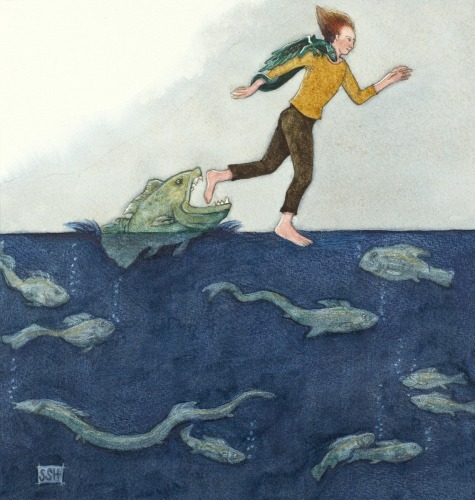 "There's a fishy kind of danger below and behind, but the man and his mysterious creature run on calmly confidant and intent upon their journey." 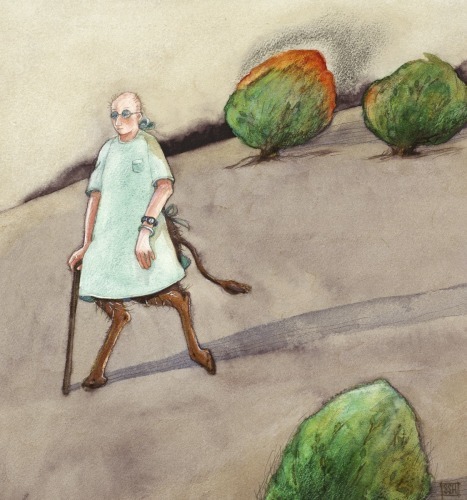 "The burning bush beckons, but the strange, centaur-like creature walks by without a glance. He doesn't hear the message that Nature is giving him, and one can't help but wonder what dire circumstances he is likely headed for." 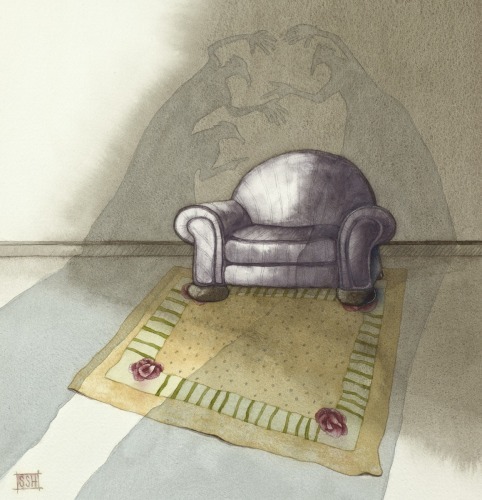 "The room is warm, the chair is comfortable but there is no rest at all. Memories, imaginings, pain and maybe regret haunt the would-be relaxer. Where has he escaped to, one wonders?" 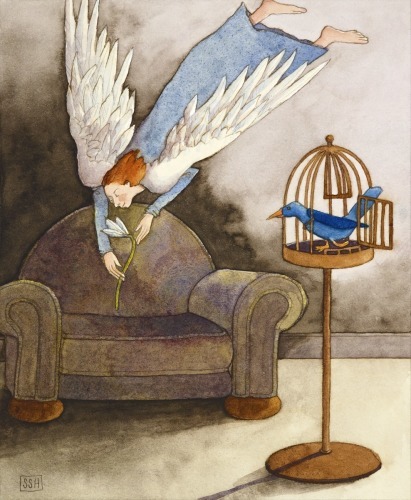 "A baby bird's first flight...safe under the protection of angels and the larger scheme of things. Safe and free to test her new wings: how delicious!" "The planning and the concept were excellent...what could have gone wrong? 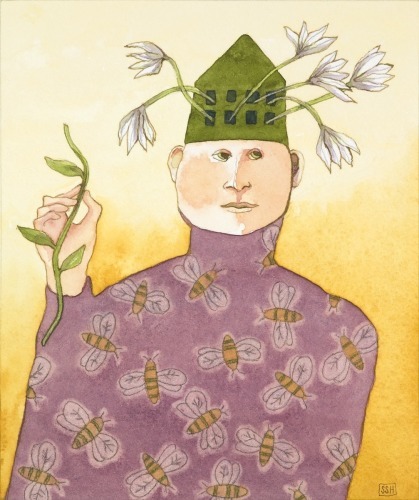 It's that old story: many a slip 'twixt the lip and the spoon...but this time with flowers, it seems." "The quintessential angel, guiding and watching over her charge." Pen-and-ink and watercolor on 90# CP (185 gsm) paper. 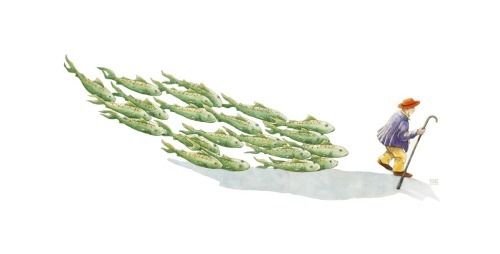 "A very calm fish herder, followed by a school of mysterious flying green fish. Does he know who he leads...and does it matter?" "Have you ever walked in the forest alone, thinking with your mind, "I am lonely"...but then felt in your heart the sweet fullness of existence? Look closely and you'll see a tiny infinity sign between the two right-side circles, just where they intersect." "My version of that classically surreal scene from 'Alice in Wonderland,' Lewis Carroll's 1865 novel. 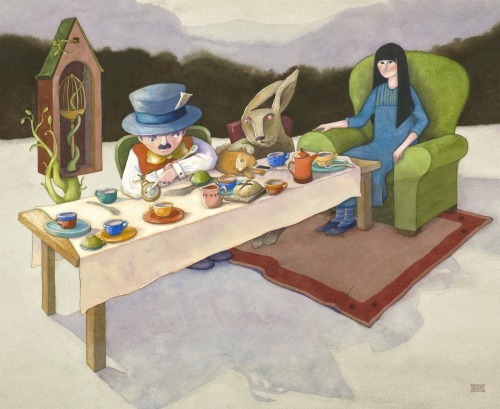 Complete with the Hatter (mad, of course), March Hare, Dormouse, and Alice. My Alice obviously knows that this is all a bizarre dream..."
"It was a fine Spring morning, and there would never be a better time to go. A deep breath, a wiggling of the roots and a leap skyward. The red house was free." 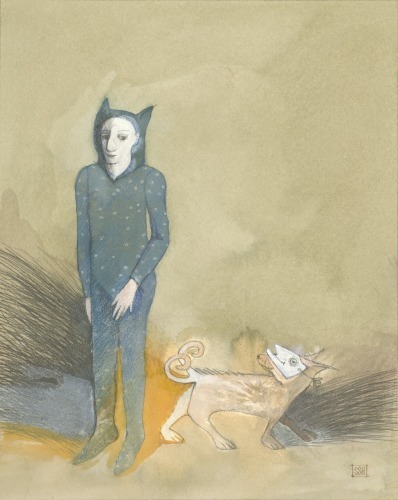 "A man in cat pajamas and a dog in a mask: they were both in disguise, and both of them knew it. 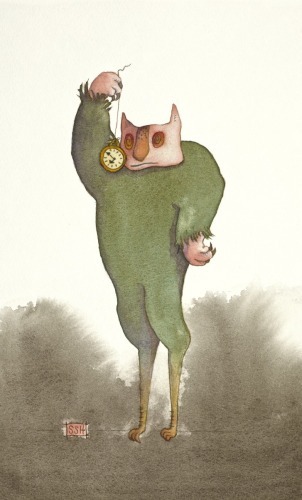 What they would do now was anybody's guess..."
"A strange monster hypnotizes himself with a pocket watch...to what end, one wonders? And are his eyes normally so very red?" 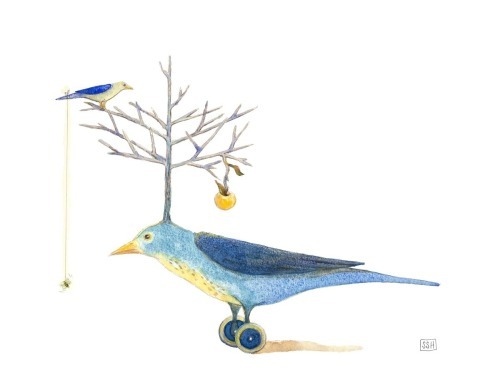 "Mr. Tweet began his journey to find a new home. 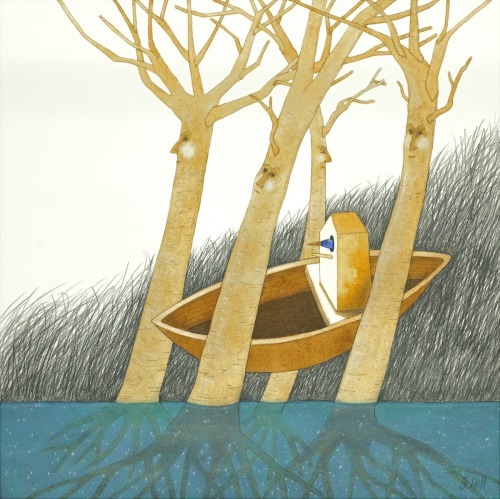 The silent trees watched him float quietly by..."
Pen-and-ink and watercolor on 140# CP (300 gsm) paper, unframed. "Wouldn't you just love to know what's going on in their tiny heads? Trees, bugs, pondering on the meaning of life...who knows what it might be?" 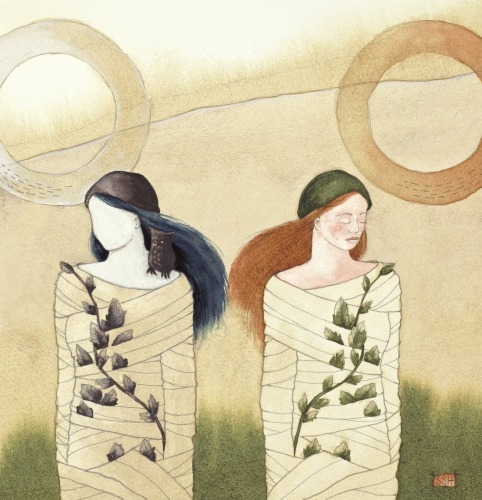 "The need for going inward: to reconnect with oneself and to find the Stillness once again, to listen for insight and Guidance...to rest one's weary mind." "Blessings just show up!! Here, a masked angel is about to give a blessing to an unsuspecting (and maybe a little bit cranky) king. Will he be able to receive it, I wonder...?" Original pen-and-ink and watercolor painting on 140# CP (300gsm) paper, unframed. 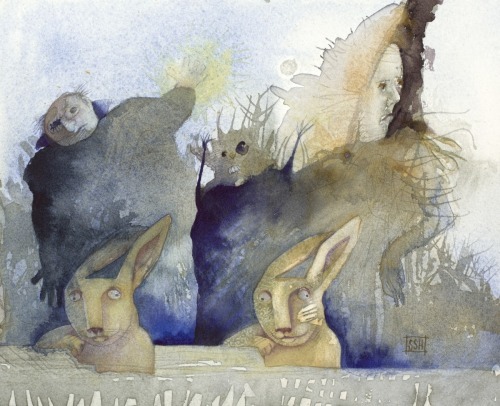 "It was never mentioned in Lewis Carroll's 'Alice in Wonderland,' but perhaps it was the March Hare's repeating nightmare, pictured here, that caused his eyes to go all googly, and his personal habits to become, well, rather eccentric... It could happen to anyone, I suppose." Original pen-and-ink and watercolor painting on 140# CP (300 gsm) paper, unframed. 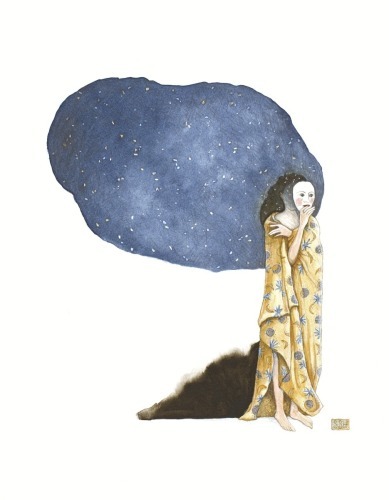 "A mysterious woman holds a socially-correct, powdered and painted mask in front of her face, while behind her, Infinity (that mysterious Other part of herself) beckons." Original pen-and-ink and watercolor painting on 90# CP (185 gsm) paper, unframed. 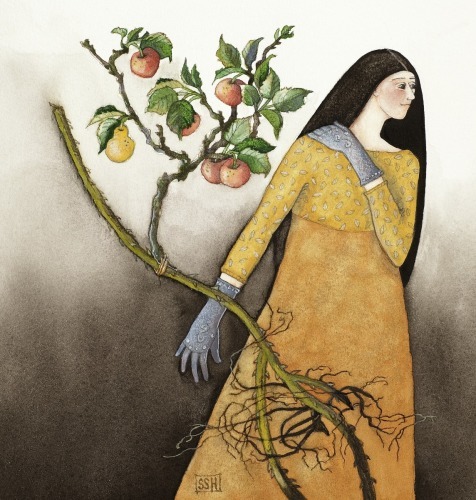 "True wisdom, only found deep within, is represented here by a tree and rooted figure who bears the leaf and nearby fruit of her inner searching. It's a gentle kind of knowing." 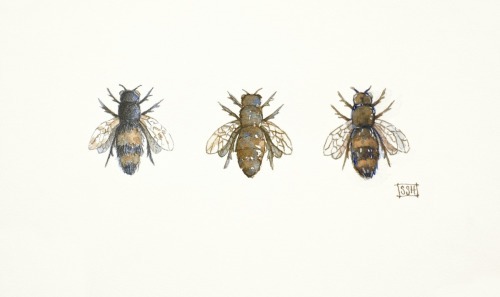 "A trio of deliciously delicate, softly colored bees, rendered in three styles (from left to right): pencil with watercolor; all watercolor; and pen & ink with watercolor. A whimsical insect study, more fantasy than fact." 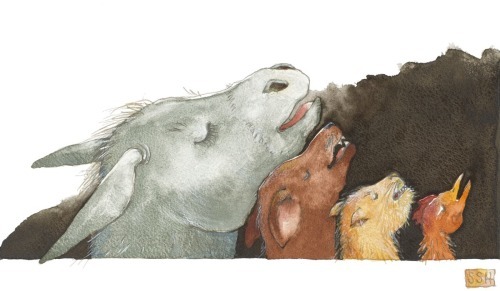 "Four elderly animal friends make beautiful (relatively speaking) music together and find a new life for themselves in the process. 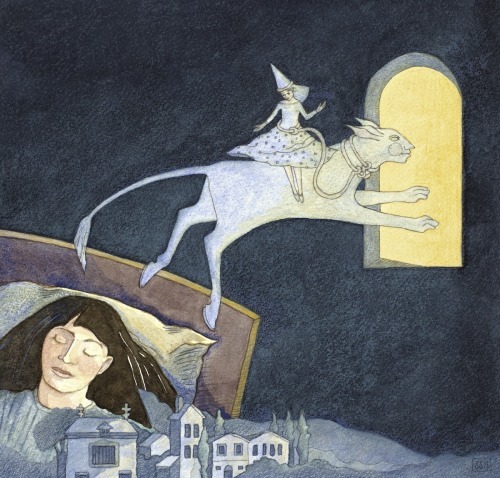 Inspired by the Grimms' fairy tale of the same name." 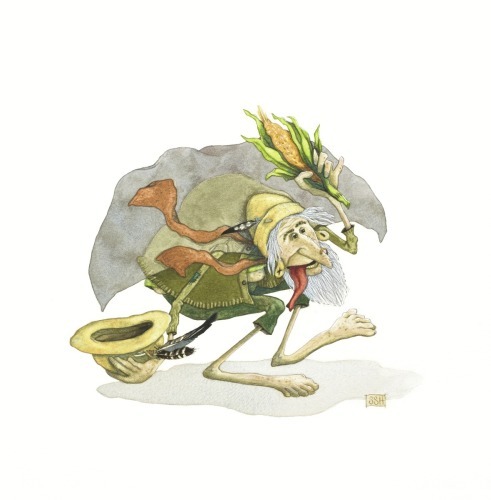 An Old World English fairy, Tiddy Mun was reported to be the elder male of the Tiddy people, a physically repulsive bunch with thread-like limbs, long noses, and wide red tongues dangling from elongated mouths. When the Tiddy people were happy, they would help corn to ripen and all green things to grow. Food and drink offerings were made frequently to the Tiddy people to ensure a good harvest. 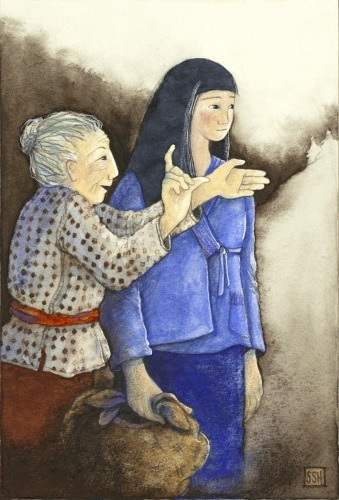 This painting was a recent commission for the Wit's End Puppets troupe in Washington, DC, used to inspire the creation of a puppet for one of their productions. 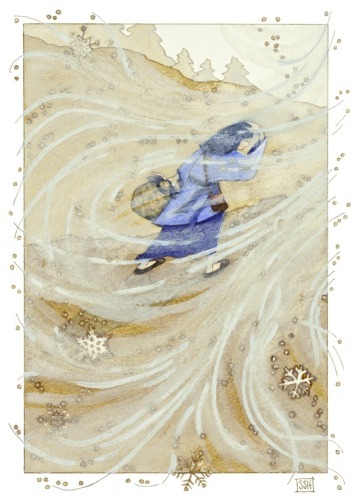 "An icy wind tore at her clothes and covered the path." 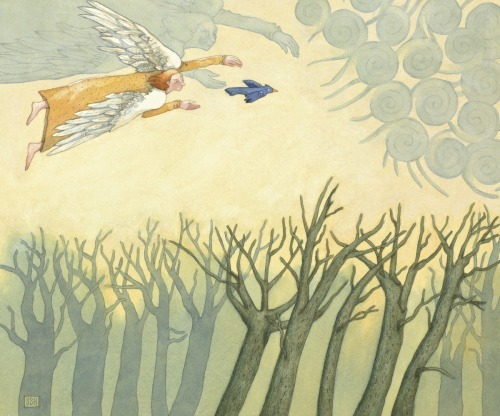 An illustration from my not-yet published children's book, The Emperor's Pear Tree. Pen-and-ink, watercolor and gouache on 90# CP (185 gsm) paper, unframed. "It is not a task for the faint-hearted," the old woman added. 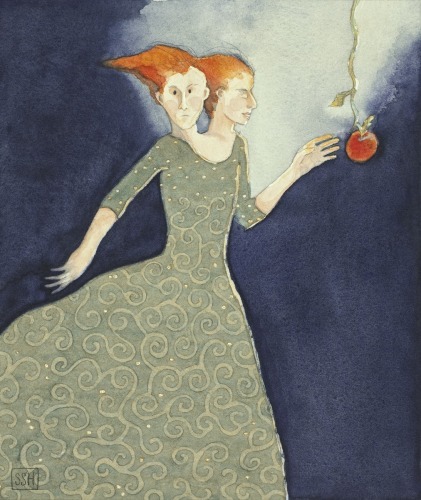 An illustration from my not-yet published children's book, "The Emperor's Pear Tree." 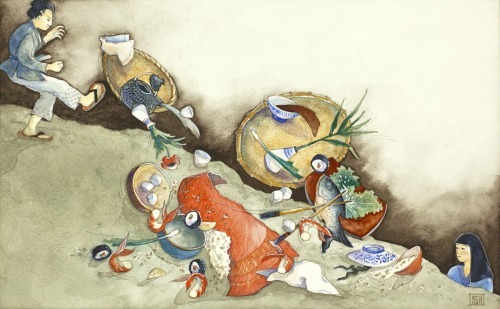 Pen-and-ink, watercolor and colored pencil on 90# CP (185 gsm) paper, unframed. "Even Aiko's best cooking could bring no smile to the face of the man she had once known and loved." 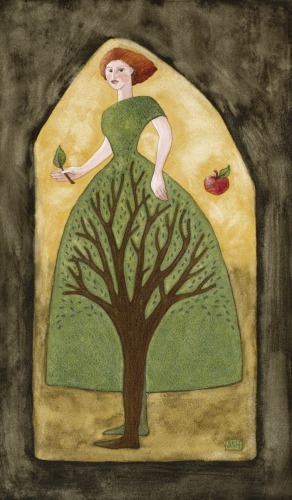 An illustration from my not-yet published children's book, "The Emperor's Pear Tree." 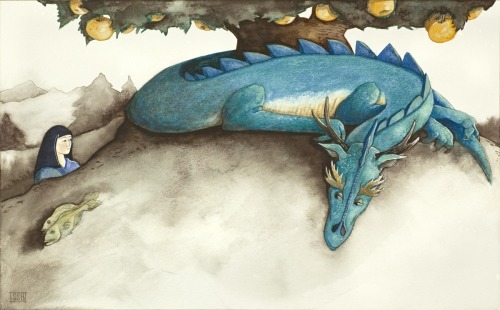 "...the dragon lay coiled around the base of the Emperor's pear tree..."
An illustration from my not-yet published children's book, The Emperor's Pear Tree. "Without warning, the air was filled with a blue-green whirring and flashing." 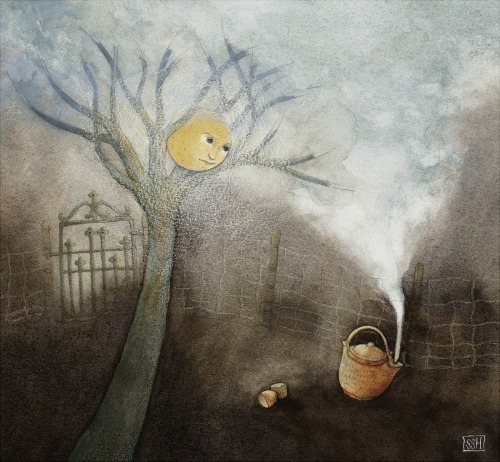 An illustration from my not-yet published children's book, "The Emperor's Pear Tree." 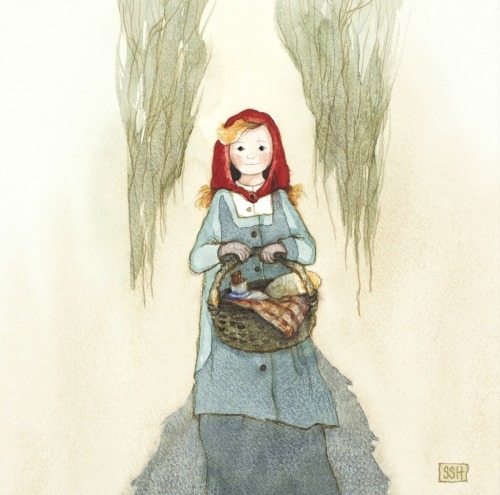 "Little Red Riding Hood is about to meet The Wolf for the first time. Little does she know! But being a fairy tale, it all works out in the end (except for the wolf, of course)." 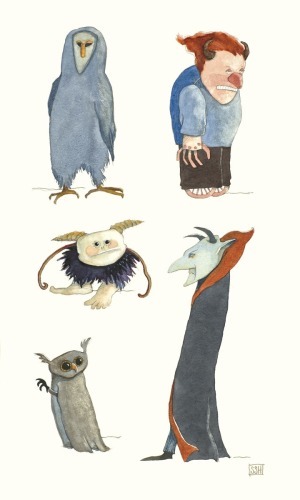 "Character studies of not-so-scary demons from my not-yet published children's folktale, The Teapot's Tale. This image is the first of three demon paintings, inspired by a story about Milarepa, the legendary Tibetan yogi and poet. Wouldn't collecting all three in the series -- Demons no. 1, Demons no. 2, and Demons no. 3 -- make an enchanting triptych?" Pen-and-ink, watercolor on 90# CP (185 gsm) paper, unframed. 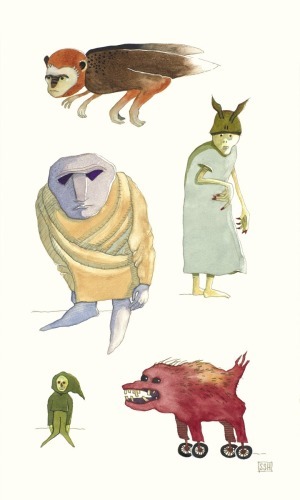 "Character studies of not-so-scary demons from my not-yet published children's folktale, The Teapot's Tale. This image is the second of three demon paintings, inspired by a story about Milarepa, the legendary Tibetan yogi and poet. Wouldn't collecting all three in the series -- Demons no. 1, Demons no. 2, and Demons no. 3 -- make an enchanting triptych? 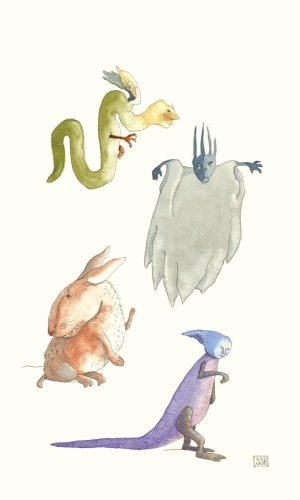 "Character studies of not-so-scary demons from my not-yet published children's folktale, The Teapot's Tale. This image is the third of three demon paintings, inspired by a story about Milarepa, the legendary Tibetan yogi and poet. Wouldn't collecting all three in the series -- Demons no. 1, Demons no. 2, and Demons no. 3 -- make an enchanting triptych?" 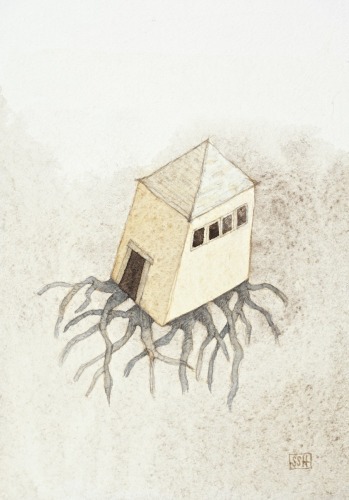 "We think of a house as a rooted, stable structure, something to count on. 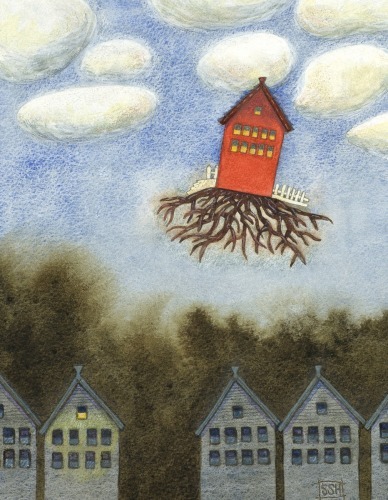 But what if houses could fly and relocate on a whim? What freedom...but how very disconcerting for us!" 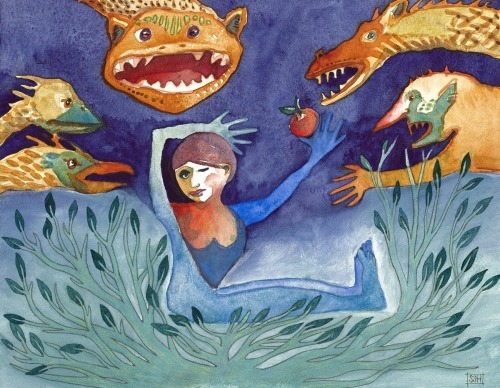 Demons and beasts all around, and the apple was the only thing she had to offer them, aside from her very life. Would it be enough...? " Original watercolor, gouache and colored pencil on 140# CP (300 gsm) paper, unframed. 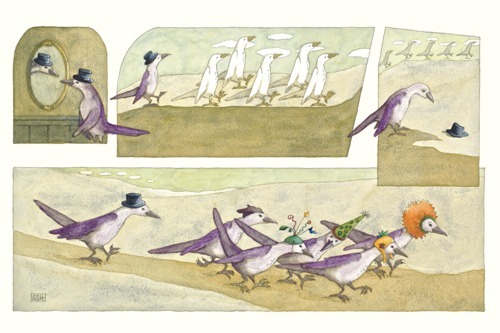 "A tongue-in-cheek tale about the hazards and rewards of the journey to find a group of friends that fits the Real You. 'Let your freak flag fly!' a wise man once said. Apparently, this applies to birds too..."